Linda Sarsour is a name that has become increasingly prominent in U.S. Leftist political circles over the past few years. As detailed by previous Center for Security Policy work, she has been carrying out the curious mission of tying the toxic doctrine of Shariah to the Western feminist movement. It turns out that when Linda Sarsour isn’t selling that bill of goods, she’s on Twitter misleading the world about Shariah-compliant finance. This is a subject that we have covered fairly extensively on Shariah Finance Watch over the years and it amounts to financial fraud. It is also widespread in the Shariah Finance industry. It is quite common for entities and individuals in the Shariah Finance industry to point out that Shariah-compliant products and entities are forbidden from charging or earning interest. 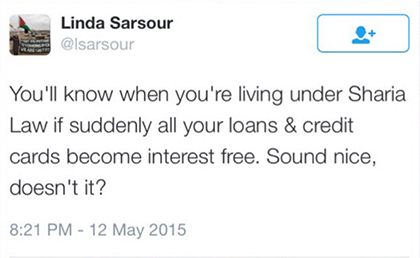 The inference here is that Shariah banks and credit cards lend money for free. That is absolutely wrong. The use of the term “interest-free” in this context is completely misleading and, by U.S standards, would be a compliance violation. This implies that Shariah-compliant loans and credit cards, which do not involve interest, do not charge borrowers. Interest free does NOT mean FREE money and just because a loan doesn’t charge interest doesn’t mean that the lender is giving away money without charging for it. Shariah-compliant loans do involve charges and fees which, by the way, often add up to a greater expense than conventional loans that do charge interest.